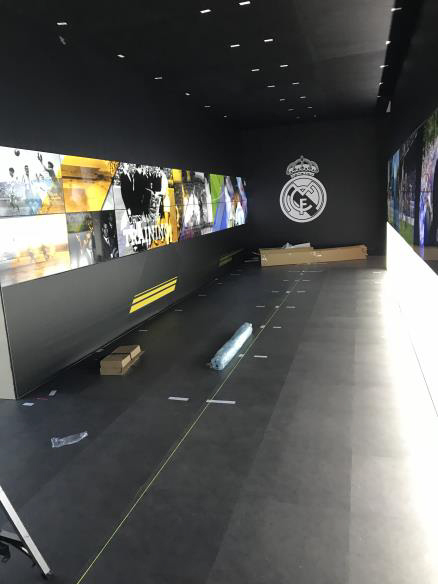 The Real Madrid World of Football Experience is a new, state-of-the-art, digital and physical interactive soccer (football) experience designed for all ages. Starting in Melbourne, the Experience travels around the world visiting 15 cities and connecting with the club’s fan base, estimated at 140 million worldwide. As visitors enter the massive 50m x 30m touring pavilion created by Interp, they are wowed by two 18-screen videowalls powered by BrightSign players programmed by Amped, associated with a wall of sound. Content was created by Tania Price of Immersiv. Creating videowalls on this scale is a challenge in itself–but most walls of this size are built just once. The World of Football Experience will bed is mantled and reassembled at least fifteen times around the world without the original designers being present. The videowall has to work flawlessly out of its’ packing cases each time.